Today’s post is a response to theologian Michael Hardin‘s five-part series on the Eucharist. I first read it about a year ago, and found it world-tilting in its implications. You can read the entire series here. Michael asked me if, in this run-up to Easter, I would share some reflections by way of a response to this series. I’m honoured and delighted to do so. There are vast divergences of corporate practice within the established church in its manifold forms. The Eastern Orthodox have their icons, bells and smells; the Roman Catholics have their confession and absolution; the charismatics and Pentecostals raise their hands and speak in tongues… In short, we have a multitude of different ways of expressing ourselves in corporate worship. Yet there is one piece of liturgical practice that is common to every single Christian denomination. It goes by different names – the Eucharist, Holy Communion, the Lord’s Supper, the Breaking of Bread – but while its format and presentation may vary slightly from one church to another (hosts/wafers versus bread, wine versus juice, open versus closed communion), it is instantly recognisable as the centrepiece of collective Christian practice across the denominational map. 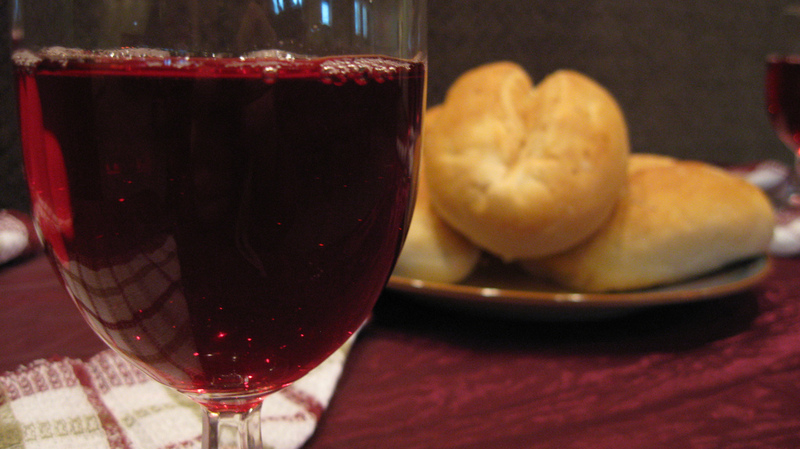 As a Christian of thirty years, the Eucharist had become very familiar to me. Like every other believer, I knew it was to be revered and treated with great solemnity. And I knew it was representative, in some mysterious way, of profound truths about Jesus’ death and what it accomplished for us. But can I be brutally honest? While many other believers appeared to swoon with heartfelt devotion over the bread and the wine, I would often feel I was doing little more than going through the religious motions, performing a ritual which, in spite of its familiarity, largely remained strange and inexplicable to me. Then, about a year or so ago, I read Michael’s posts about the Eucharist. This was in the midst of a time when my theology had already undergone major tectonic shifts, so I guess you could say I was ripe for a new understanding of this most central Christian practice. Suddenly, lights went on, pieces fell into place, and the Eucharist began to make sense in a way it never had before. I won’t presume to try to explain or distill down Michael’s teaching on the Eucharist; I’ll simply urge you to read it for yourself. I’ve thought long and hard about how I might best explain how my understanding of the Eucharist has changed in light of Michael’s teaching, and in the end I’ve come down to this conclusion: it’s best to keep things simple. There are many details and nuances I could go into, but space and attention within a single blog post are limited. So I’m simply going to focus in one thing – one major thing – that has changed in my understanding and experience of the Eucharist. Put simply, the breaking of Jesus’ body had always seemed to me to be something for which I should feel appropriately grateful, but which, when all is said and done, was the result of someone else’s actions. Whether that someone else was the Romans, the Jews, humans in general, or God didn’t matter too much; the point was, it wasn’t specifically and personally me. The practical result of this on a Sunday morning was that I felt somewhat detached from whatever it was that Holy Communion was supposed to evoke in me. I felt grateful, but really only because this was how I’d been told I should feel, not because the whole ritual engaged my innermost being at a deep, personal level. This feeling of detachment from the Eucharist and the events it recalls is, I now believe, the inevitable result of understanding Jesus’ death as nothing more than a divinely ordained legal transaction. Just as an accused party might be acquitted on a technicality without ever having to set foot in court, so I could enjoy the benefits of being legally acquitted without any of the events from which I was supposedly being discharged ever actually having anything to do with me. But what if those who broke Jesus’ body consisted not only of political and/or religious bodies far removed for me in both time and culture? What if the Eucharist powerfully represented and re-enacted something that concerns and implicates me personally, in the here and now? What Michael’s posts helped me to see was that, far from being some abstract religious ritual, the Eucharist is, in fact, a graphic re-enactment of something you and I have done countless times: blamed, cursed and scapegoated an innocent victim. We assuage our consciences by projecting all of our hatred and insecurity onto an undeserving victim, and as we watch them die under universal condemnation, we congratulate ourselves that, whatever our shortcomings, at least we aren’t as bad as they are. Maybe they’re a racial or ethnic minority, maybe they’re gays, maybe they’re just people who believe or see the world differently from us; the point is that they inevitably become the recipient of our scorn and violence (whether literal or figurative) and the basis of our self-perceived justification. Into the midst of this age-old pattern of scapegoating, self-justifying violence steps Jesus. As a sheep before its shearers is dumb, he opens not his mouth. He dies under our jeers and curses, and as we bury him, we congratulate ourselves on our righteousness. This, my friends, is what we do when we break the bread: we remember Jesus not as some remote legal substitute, but as the ultimate representative of all the countless victims we have ever assassinated, immolated and buried. And then comes the wine of Jesus’ blood. I used to think of this as some potent elixir that would magically wash away my guilt. Now I understand that the innocent blood of Jesus is nothing less that the tangible sign of the outpouring of God’s never-ending forgiveness in the face of horrific and undeserved violence. And not horrific and undeserved violence in general, against an abstract other; my horrific and undeserved violence in particular, against so many of my fellow humans. So there we have it: bread broken and wine drunk represent my complicity in the breaking of the True Human, and his response of mercy and forgiveness. And in this way, the bread and the wine no longer create a sense of detachment from those events of so long ago outside Jerusalem; on the contrary, they connect me to and draw me into those events in a very real and personal way. I am Peter, who will deny Jesus three times; I am Judas, who will betray him; I am even the Roman executioner who will gleefully drive the nails into his wrists and plunge the spear into his side. But I am also the one to whom he will appear on the third day, smiling, and say “Shalom!”. His blood is the blood of the New Covenant, and it is a covenant not of scales and balances, of implacable justice, but of mercy and peace, in spite of all our vindictiveness and violence. All that remains for me to do is to heartily recommend that you go and read Michael’s piece on the Eucharist. If you’ll let it, it will redefine your entire theology. Read it, and drink deeply from the Gospel of peace. Then meet me at the table, and let us eat and drink together, and be grateful and glad.